Applicable For : Students for pursuing studies from class XI and onwards up to Ph.D. This stipend is awarded to the students who are resident of West Bengal and have passed their last final examination and obtained below 50% marks and must have secured pass marks in his/her last examination. ** Students pursuing Higher Secondary, UG, PG, M.Phil etc. courses are eligible. ** Annual family income of the applicant should not exceed Two lakhs. ** Institute must be located within the state. ** Students should have passed with less than 50% marks in the last final examination and domiciled in West Bengal. 1. This scheme of the Govt. of W.B. is open for the students belonging to minority communities (Muslim, Christian, Buddhist, Sikh, Parsi & Jain). 2. The above stipend under the Talent Support Programme is to be awarded to the above minority students to enable them to study from class XI upto PhD. 3. 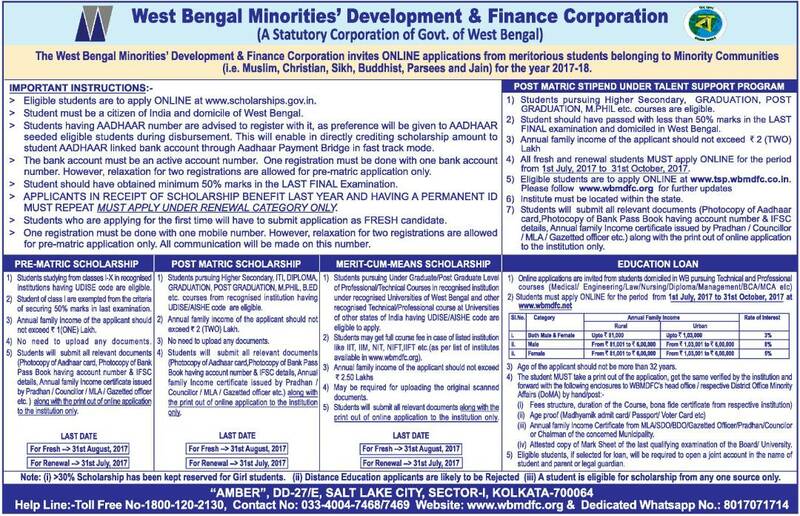 This Stipend is to be awarded to the students who are residents of West Bengal and have passed their last final examination with less than 50% Marks in the last Board / University Examination [STUDENTS SECURING MORE THAN 50% MARKS IN LAST EXAMINATION ARE NOT ELIGIBLE]. 4. The annual family Income of Parents / Guardian should not exceed 2 (two) lakhs. 5. The stipend is awarded one time in a year. 6. The online application form will be available from tsp.wbmdfc.co.in. 7. Students pursuing regular courses of study only are eligible for this scholarship . [STUDENTS OF DISTANCE LEARNING MODE ARE NOT ELIGIBLE FOR THIS SCHOLARSHIP]. 8.Maximun 2(Two) students may apply from a family. 9. The students obtaining benefit under this scheme shall not be allowed to avail any other benefits under any other scholarship scheme . [IF A STUDENT IS IDENTIFIED TO HAVE APPLIED FOR MORE SCHOLARSHIP THAN ONE, ALL APPLICATIONS WILL LIABLE TO BE REJECTED ]. 10. Applicants are advised to open Bank Account preferably in a Nationalised or scheduled Bank having IFS Code as the scholarship amount would be disbursed through Direct Benefit Transfer(DBT) mode only. 11.Students must download the filled in online application and take a print out thereof. The same should be submitted to his/her Institution along with Annual Income certificate, Page of passbook indicating name, account number, IFSC. Income certificate may be issued by Pradhan/ Ward councilor/ Gazette officer/ MlA/ MP. ** Students must be a citizen of India and domicile of West Bengal.